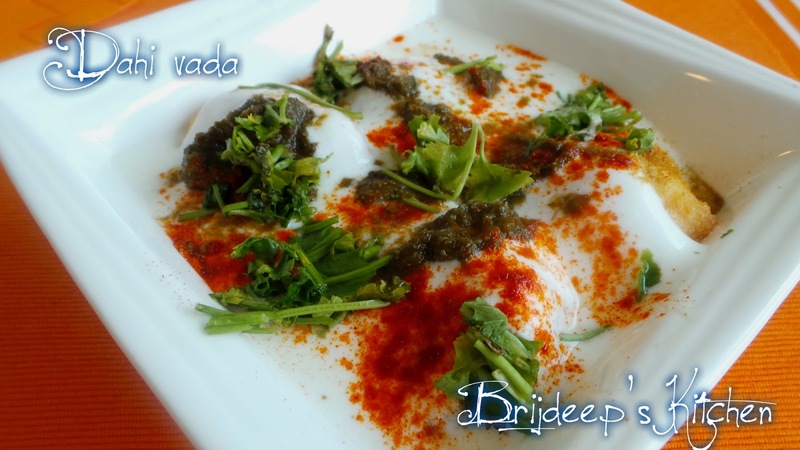 Dahi vada.. mmm pleasure !! This is one ultimate cooling snack item of India which is popular among all age groups: the kids love it, the middle-aged ones like it and the seniors love the mildly spiced taste of these soft and fluffy dumplings dunked in yogurt and topped with spices to result in a super star and out of the would pleasure with each bite you take of this Dahi Vada. 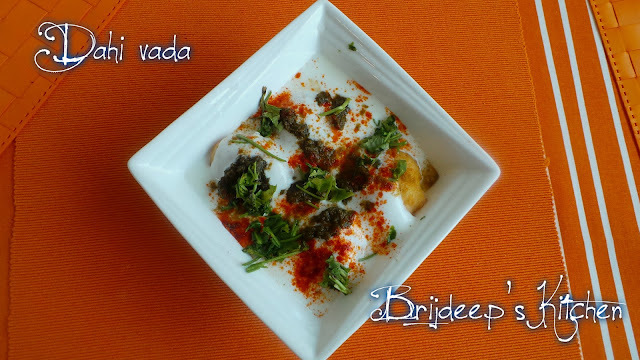 This is a wonderful snack and chaat, specially to be enjoyed during summers. My Nani Ji is an awesome cook and she loves to eat. I remember taking her to chaat corners for eating chaats and bhel puri, pani puri etc. 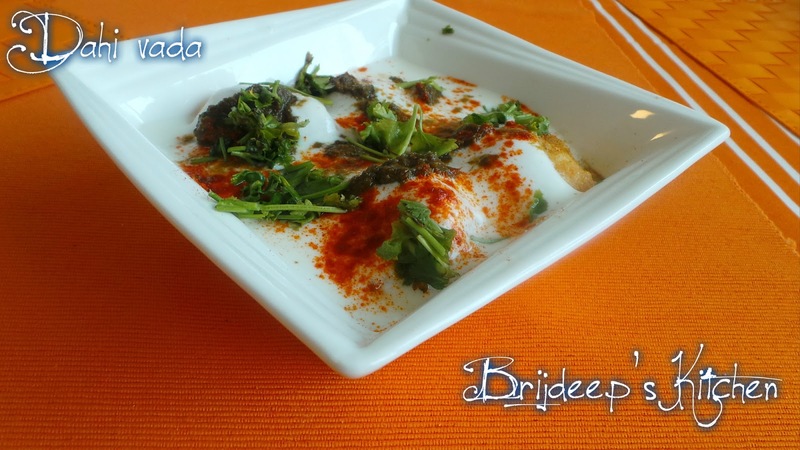 but her favorite was always Dahi Vada. 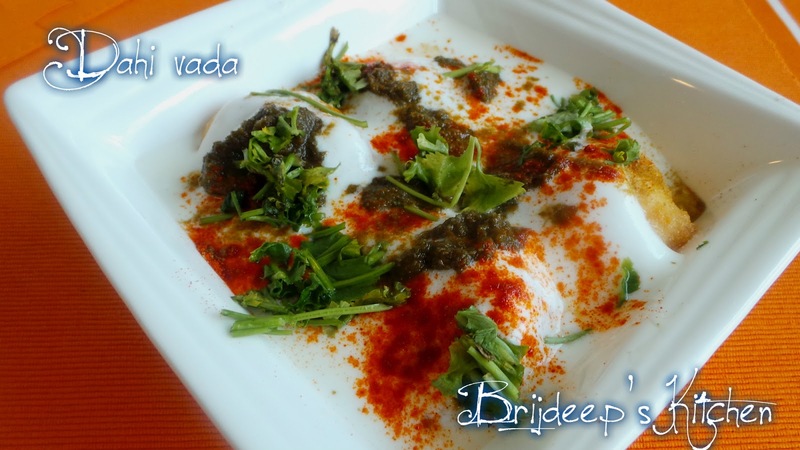 This recipe is simple and that's how my nani and mother make it. My mother is a doctor and Naturopathy professional and so she uses moong dal instead of urad dal for the vadas as it's healthier. 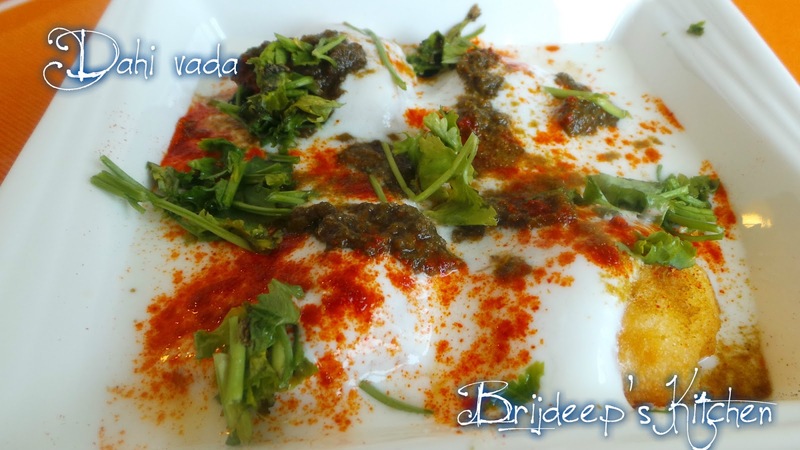 So even I have used moong dal in this recipe. Wash and soak the moong dal in water for about 6-7 hours or overnight. Drain the water and add the soaked dal to the grinder and without adding any water, grind to a smooth paste and take out in a wide bowl. Add the ginger and green chillis and mix well. Now mix this batter vigorously for some time until it becomes soft and fluffy; this will take about 15 minutes. This step will help the vadas be soft so don't skip this step. Now heat the oil on medium high and add spoonfuls of batter to the oil, try to make it round but not necessary. Keep a close eyes and as soon as vadas start forming the shape (that is, they will not break), turn the flame to medium low and let cook. This step is important (i.e. reducing the flame) so that the vadas get completely cooked from inside. Keep turning and when the vadas start becoming golden brown, drain the oil and remove on a kitchen paper to absorb extra oil. 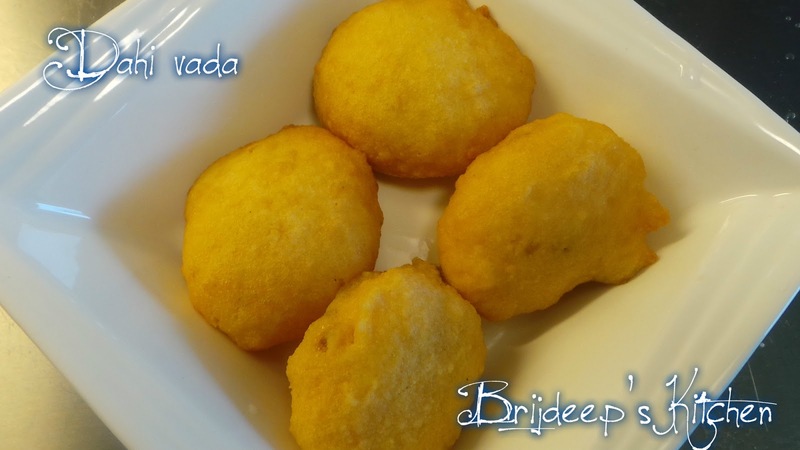 Repeat with all the batter and prepare vadas. 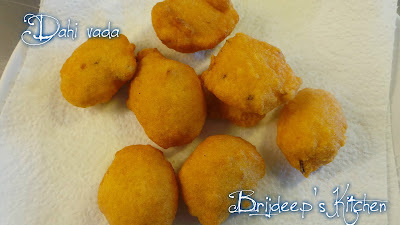 Let the vadas cool a bit and then add all the vadas to a big water vessel. Let them soak in the water for about 15 minutes so that they become soft and fluffy and not remain hard. 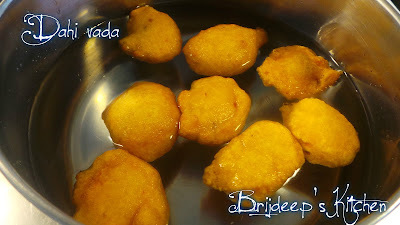 Remove the vadas from the water, one by one and squeeze the extra water from them, carefully placing the vadas between your palms and applying little pressure carefully so as not to break the vadas. Place all the vadas in a big serving bowl. Pour the whisked yogurt over the vadas. Sprinkle salt, red chilli, cumin powder, mango powder on it and add both the chutneys. Garnish with fresh coriander leaves. Freeze for 2 hours and take out. Serve chilled. Looking for more chaat recipes? Try this Pao Bhaji, Mint egg salad, Papdi Chaat and Apple Walnut Salad. Looking for more snacks recipes? Try this 3-minute microwave dhokla, 3-minute rawa dhokla, Tomato Poha, Potato Cutlets, Wheat Samosa and Whet Kachori.